According to the American Association of Paediatrics (AAP), going old-school is best when it comes to toys —if boosting mental and physical development is your priority. 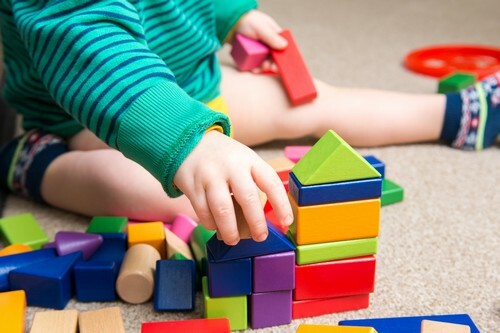 In the recent report, Selecting Appropriate Toys for Young Children in the Digital Era, the AAP suggests you skip the aisle of flashy, noisy playthings in favour of the timeless classics—like blocks or dollies. Much like most digital ‘smart’ items, hi-tech toys have the primary goal of absorbing attention with minimal input. But the AAP emphasises that play is about togetherness—and, it’s the ‘together’ part that facilitates learning through play, too. The corollary is that not only are toys with All The Things subpar developmental tools, they also do nothing to strengthen bonding with your child—because you don’t need to be there for them to engage with the gadget. “While it’s easy to fall victim to the marketing, you are your child’s best teacher,” the AAP stresses. “For example, an 18-month-old child might try to use blocks functionally (eg, stack them), whereas a 2-year-old might use the same blocks to engage in sophisticated symbolic play,” explains the report. Paint, paper, glue…simple staples considered by the AAP “high quality toys”—not because of price tag, but because they allow children to explore creativity. If your tot is too young for a palette of paint, start off with baby-friendly artsy activities like this to inspire the senses and prime them for future art sets. Balls, push-bikes and pull-toys, etc. boost physical development, obviously. But the key point is that they foster the idea that physical activity is positive and enjoyable. Flash card games build language and literacy in a way superior to any app—because absorbing the rules and nuances of a language happens best during social interaction. Plus, the tactile factor commits the learning to memory more effectively than images and floating words on a screen. Think dollies, action figures, and the prerequisite menagerie of toy animals. A toy kitchen, too. All of these encourage imaginative play, sparking little ones to use them as props in their make-believe narratives. “Such imaginative play ultimately facilitates language development, self-regulation, symbolic thinking, and social-emotional development,” says the AAP. Your Baby Only Recognises You if You Look At Her Directly, Says StudyMeningitis: What Are the Signs?